In the days when many in the province had never even heard the word ‘fracking’, Stephanie was busily criss-crossing the entire province on her own, on highways and back roads, at all times of the day or night, educating anyone who would listen about the dangers of this new method of fossil fuel extraction. Where her words fell on comprehending ears, new local organizations sprung up around the province in response, eventually resulting in a united front of Anglophone, Francophone and indigenous groups, who, through their efforts, were able to bring a halt to UNGOD in New Brunswick. Looking back now to the early civil disobedience by these groups in Stanley and Taymouth, the relentless protest activities of the Council of Canadians and the Wolastoqiyik, the collaborative, province-wide ‘Voice of the People Tour’, the explosive events and suffering of the Mi’kmaq and their allies in Rexton that gained international attention, and the precedent setting lawsuit from the New Brunswick Anti-Shale Gas Alliance, we forget that all these large and significant events trace their genesis back to an understanding of the dangers of UNGOD. And that understanding can in many cases be traced back to Stephanie, whose lectures and presentations, thoughtful writing and voice of reason in the media, brought information and clarity to the issues. 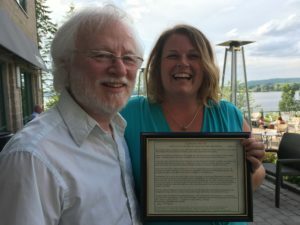 In appreciation of her efforts, the undersigned groups wish to thank and salute Stephanie, as she heads to a new position in Saskatchewan, where she will continue to work and research how to best protect the substance that connects us all, freshwater. Stephanie, our best wishes go with you. Posted in: NBASGA, Water Issues.